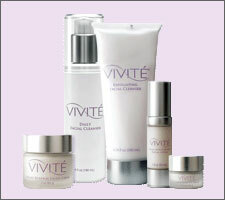 Vivité is an advanced skin care line developed by Allergen the makers of M.D. Forté, Prevage M.D., and BOTOX. Vivité Skincare formulations are based on exclusive GLX technology, a unique fusion of glycolic compound promotes the production of hyaluronic acid, collagen, and epidermal growth factor in the skin. In a clinical study reduction in fine lines, skin hydration, and improvement in skin smoothness were seen in 3 weeks.